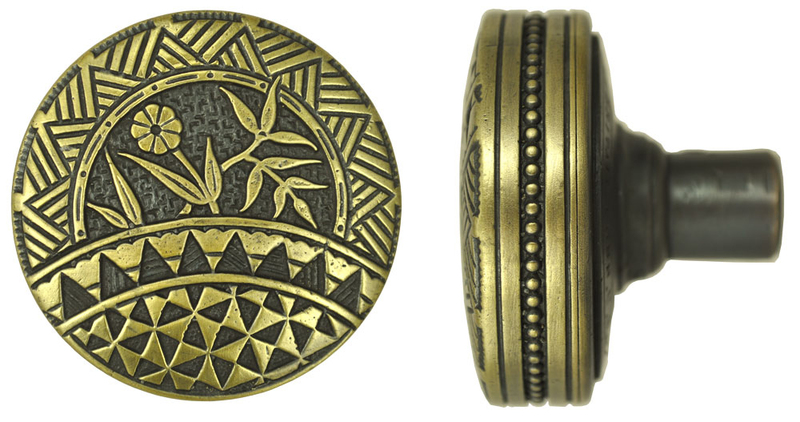 This is one of the rarest aesthetic movement doorknobs produced by R&E, designed by R.E. Christensen, Pat: # 11,229, June 3, 1879. You can begin to see the movement away from scrolled, ornate Victorian design, with a step toward the geometric Art Deco lines. Therefore this piece would be at home in Art Deco and Art Nouveau decor as well. 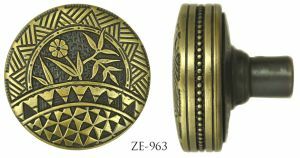 Various aesthetic design elements are used in this doorknobs, which includes the sunflower to give a very pleasing effect. Usually used with backplate ZE-810. Knob measures 2 3/8" in diameter, and projects by 2". This doorknob is sold by each. If you want a set, order two doorknobs and connecting doorknob shaft . For very thick doors, we sell an extra long 5" spindle that may be trimmed as needed. We offer an extensive selection of Victorian doorknob roses and doorknob backplates in many styles to suit this doorknob. Of course our preference would be the R.E. door plates ! We also make a lovely Windsor door>platewiththeturnlatch included.